BRISBANE’S faithful have been invited to join about one million Polish Catholics expected to attend a large rosary prayer session along the country’s border to mark the end of the Fatima centenary, and to pray for the salvation of their country. 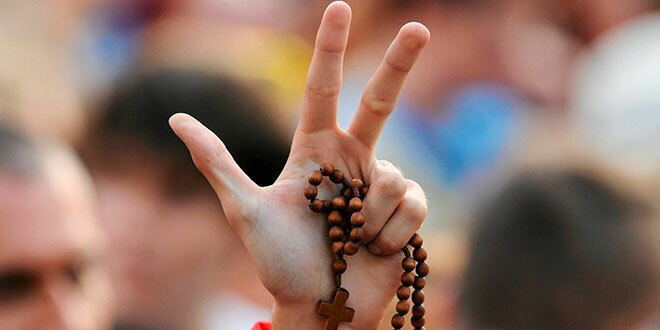 The “Rosary on the Borders” event on October 7, will be held to coincide with the feast of Our Lady of the Rosary and the anniversary of the Battle of Lepanto – where “the Christian fleet” saved Europe from “Islamisation” in 1571. “We believe that if the rosary is prayed by about a million Poles along the borders of the country, it may not only change the course of events, but open hearts of our compatriots to the grace of God,” the organisers said. The Polish bishops’ conference endorsed the event, and asked all Catholics to join the rosary prayer even if they were physically unable to make it to the border. “Families may pray in their homes, sick in hospitals, and parish communities in their churches,” they said. Rosary on the Borders is a “special opportunity” to fulfil that calling. Brisbane Polish priest Fr Andrzej Kolaczkowski has encouraged Queenslanders to attend a Rosary prayer of consecration at 10pm tomorrow at Our Lady of Victories Church, Bowen Hills. “It is even more symbolic that the title of Our Lady of Victories was given to Mary by Pope St Pius V to commemorate the victory at Lepanto,” Fr Kolaczkowski said.